A video posted online shows fighters from the Kurdish People's Protection Unit fighting off jihadists from Al-Qaeda-linked Al-Nusra Front. Amid speculations of an impending attack in Syria by Western states, the fighting in the country’s civil war continues. A video recently posted online shows fighters from the Kurdish People's Protection Unit (YPG) fighting off jihadists from the Al-Nusra Front, which has pledged allegiance to Al-Qaeda. 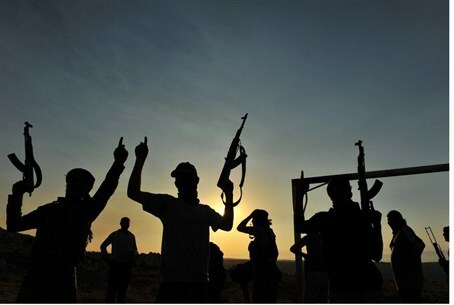 In addition to the war between Syrian President Bashar Al-Assad's troops and the rebels fighting to oust him, Arutz Sheva has reported over the past several weeks about another civil war in Syria, this one between Al-Qaeda loyalists and thousands of Syrian Kurds. Kurdish fighters have been battling the Islamists, most of them members of Al Qaeda-affiliated groups, and ordinary Kurds have been caught up in the fighting. The YPG has been involved in fierce fighting with Al Qaeda-linked Islamist groups over control of Kurdish-majority regions in northern Syria. Not long after the start of the uprising against the Assad regime, government forces pulled out of Kurdish areas, and the YPG moved in to take control. Arab groups within the rebel Free Syrian Army (FSA) initially made a grab for Kurdish areas but were beaten back. In recent months, however, the jihadist rebel groups have led a concerted and violent campaign to install their own independent "emirates," or Islamic mini-states in the region. That was met with fierce opposition by the YPG, who responded by ejecting Islamist forces from the town of Ras al-Ain among other areas. As the fighting has continued, thousands of Syrian Kurds seeking to escape persecution at the hands of Jihadists, have been crossing the border into the autonomous Kurdish area of northern Iraq.